Articular cartilage injury is damage to the tough, thin cartilage that lines the ends of bones. It is often caused by a collision or trauma to the knee or in conjunction with other knee joint injuries. 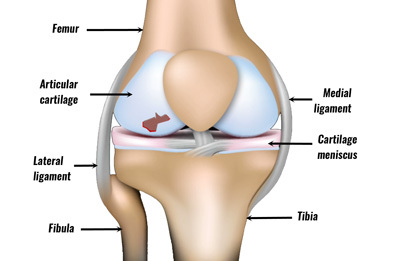 Here explain the symptoms, causes, and treatment of an articular cartilage injury to the knee. Symptoms consist of recurrent pain and swelling in the knee joint. There may be locking of the knee due to loose bodies floating within the joint. The patient may also experience audible clunks and click noises when moving the knee. Articular cartilage or hyaline cartilage it is also known as a very smooth, hard material which lines the ends of bones. It is made up of protein collagen and its purpose is to protect the ends of the bone and allow smooth movement between the surfaces of bones. In addition, articular cartilage is extravascular, meaning that it has no direct blood supply. This means that once injured it is extremely slow to heal. Damage can occur to the articular cartilage on its own as an isolated condition, or in conjunction with other knee injuries. Anterior cruciate ligament (ACL) injuries are commonly associated with damage to the medial or inner and lateral or outer surfaces of the femur (thigh bone) and tibia (shin bone). 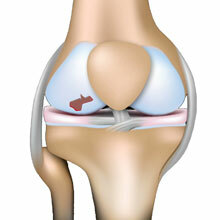 This is due to the fact that one of the ACL’s functions is to prevent rotation of the knee. In the instance of an ACL tear during a twisting movement, the articulating surfaces of the femur and tibia become damaged. Other injuries that can lead to articular cartilage damage are those resulting from a forceful impact on the knee joint, such as a tackle in football or rugby. These are commonly associated with injuries to other structures within the joint such as ACL and posterior cruciate ligament (PCL) tears as well as cartilage meniscus injury and patellar dislocations. Injury to the articular cartilage will lead to inflammation and pain in the knee joint and in the long term, it is known to accelerate the onset of osteoarthritis. In more severe cases damage to the articular cartilage may also lead to fractures in the bone lying immediately below it called the subchondral bone, also known as an osteochondral Fracture or osteochondritis dissecans. This is especially common in adolescents where the bone fragment has become dislodged. Apply RICE or rest, ice, compression and elevation to help minimize swelling. Cold therapy or ice can be applied for 10 to 15 minutes every hour in the acute stage which is usually the first 24 to 48 hours. After that reduce the frequency as the swelling goes down. A specialist cold therapy knee wrap is ideal for applying both cold therapy and compression to the knee together. A doctor may prescribe NSAID’s e.g. Ibuprofen, to address pain and swelling. A sports injury professional can correctly diagnose the injury and extent of the damage which may require an X-ray or arthroscopy. Arthroscopy is an operation where they look inside the joint to determine the extent of the injury. If the injury is not severe then conservative management may involve rest for a number of weeks followed by gentle exercise rehabilitation. In more serious incidences, in particular, those having sustained a fracture or osteochondritis dissecans surgery may be necessary to fixate the detached fragment. Another surgery involves attempts to stimulate recovery of the articular cartilage itself such as recruitment of marrow stem cells into the affected area by piercing the subchondral bone.